A look at the different votes and initiatives put forward by Latin American Council members over the past few years bears witness to the region’s commitment to justice. After a Security Council resolution referring the Syrian conflict to the ICC was vetoed by Russia and China last month, Chile—the newest Latin American state to join the Security Council—joined France, Rwanda, Jordan, Luxembourg and Australia calling for the adoption of a code of conduct restraining the use of the veto on matters involving war crimes, crimes against humanity and genocide. Chile’s president had also called for the limitation of the use of the veto by the Security Council’s five permanent members prior to its election to the Council in 2013. In an additional statement of support for the ICC, Chile noted that the Court has proven to be the best instrument to investigate grave crimes under international law and called for the integrity of the Rome Statute to be respected. 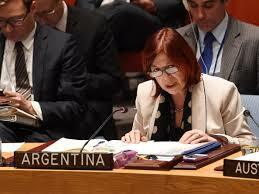 Argentina also spoke strongly in defense of the Rome Statute’s integrity after the Syria resolution was vetoed. The Argentinean representative stressed that while she had voted for the referral, she nonetheless had strong concerns regarding provisions that could undermine the Rome Statute and the ICC. Signaled that only ICC member states have an obligation to cooperate with the Court in furtherance of its investigation. Argentina previously voiced concern about such provisions during a June 2013 briefing by the ICC prosecutor. Argentina also expressed its disappointment in the Security Council’s inability to agree upon a viable plan for justice in Syria, signaling that the Council cannot continue to let politics influence its decisions to hold perpetrators of grave crimes accountable or act as though it must choose between peace or justice. Argentina’s support for international justice was also made clear in abstention from voting to grant a deferral of the ICC investigation in Kenya in 2013. In abstaining, Argentina stressed that peace and justice can go hand in hand. The South American country has also been a strong voice for enhanced cooperation with the ICC. While holding the Council’s presidency in August 2013, Argentina organized a high-level open debate on cooperation between the UN and regional and sub-regional organizations in the maintenance of international peace and security, which was presided over by President Fernandez de Kirchner. Guatemala, a relative newcomer to the ICC, has also used membership on the Security Council to promote international justice. In October 2012, while Guatemala held the Council’s rotating presidency, it organized open debates on the rule of law and on peace and justice, with a special focus on the role of the ICC. Guatemala also produced a presidential statement on the rule of law and a concept paper on peace and justice, which raised the role of the ICC in addressing impunity and deterring mass atrocities. Additionally, Guatemala requested an interactive dialogue between the Security Council and the ICC prosecutor in May 2013, which explored the relationship between the Council and the Court, underlining the need for stronger cooperation between the two. The relationship between the ICC and the Security Council is an important one, and enhanced cooperation between both organs is crucial for international justice efforts. With 11 ICC member states currently on the Council, now is an opportune time to push ICC and justice-related issue forward. So far, Latin American states have responded to this opportunity with a loud and—at times—uniform voice in support of the Court.